Nicknamed the “Ocean State,” Rhode Island—officially known as the “State of Rhode Island and Providence Plantations”—is a state located in the New England region of America and a wonderful locale for pursuing the passion of mountain biking. A coastal state, Rhode Island is the smallest state in the union by total area and the eighth-least populous. However, what the state lacks in size it more than makes up for in character, offering cyclists a wide range of exciting and scenic riding opportunities. Rhode Island is bordered by Connecticut to the west, Massachusetts to the north and east, and the Atlantic Ocean to the south, via the Rhode Island Sound and Block Island Sound. Rhode Island covers an area of 1,214 square miles and hosts a number of great ocean beaches, where riders can regularly be seen soaking up the East Coast sun while pedaling through some of the most beautiful vistas the U.S. has to offer. The state has two unique natural regions for riders to enjoy: the lowlands of the Narragansett Bay in the east, and the coastal forests in the west. Below we have provided some in-depth descriptions of five of Rhode Island’s most well-loved mountain biking trails, including their respective difficulty levels, characteristics and some of the obstacles that make each of these courses so popular among local and visiting riders. If you ever find yourself in the beautiful town of West Greenwich, Rhode Island, do yourself a favor and try out the many great mountain biking trails at the park known as Big River. Big River, also known as Carr Pond, is a large tract (8,600 acres) of pristine cycling land that regularly attracts hundreds of mountain bikers each month looking for fun and adventure. The park is governed by the region’s Water Resources Board and is situated mainly in the West Greenwich area near the exits 6, 6A and 7 along the south side of Interstate 95. The south side of Big River and Carr Pond (the north side is being considered for a new well) is home to an interesting maze of multi-use trails, formed over the decades by logging trucks and motorcycles that have packed down the hard dirt. Each of these trails hosts a number of challenging obstacles and impediments, including berms, rocks, roots, bridges and several water crossings, and each is colorfully marked according to difficulty level: beginner, moderate and advanced (blue, green and black diamond, respectively). For the past several years on Earth Day (in mid-April), a sizable group of volunteers from NEMBA, the local mountain biking chapter, have gathered at Big River to clean some of the rubbish that tends to accumulate throughout the year, ensuring that all of the courses at the park are always clean, safe and well-maintained. Located in the gorgeous town of Charlestown, Rhode Island, Burlingame State Park is a wonderful recreational paradise and a great locale for mountain bikers, regardless of their particular levels of expertise. Burlingame State Park hosts roughly 17 miles of entertaining single track courses, including the popular “North South Trail.” There is also a five-mile loop track consisting mostly of rolling hills and wide, meandering double track. The route is absolutely perfect for beginner riders and family groups, and is easily accessible from the northern portion of the park. The featured ride at Burlingame State Park is the eight-mile Yellow Dot Trail, also known as the “Vin Gormery Trail” or the “King of Burlingame Race Loop.” The trail, which runs both north and west, winds around the picturesque Watchaug Pond and features a few short technical climbs and a number of rock gardens to keep riders on their toes. While the trail is loaded with a good amount of protruding roots, the ride, when negotiated correctly, is still rather fast and smooth. Every Wednesday, Burlingame State Park hosts a group ride that is undoubtedly the best way to familiarize yourself with this one-of-a-kind mountain biking haven, as it is regularly attended by locals and frequent riders that can serve as a great resource for discovering all the hidden twists and turns associated with each trail. Located in the quaint town of Lincoln, Rhode Island, Lincoln Woods State Park is often considered one of the best and most pleasurable mountain biking parks in the entire state of Rhode Island—and the east coast. A mixed-trail facility, Lincoln Woods State Park offers courses for every level of rider, broken down into routes that are, in terms of difficulty, 30 percent “easy,” 20 percent “moderate” or intermediate, and 50 percent “difficult,” intended for very experienced and/or competitive riders only. Although relatively small in size at only 627 acres, Lincoln Woods State Park definitely makes up for its lack of size with the quality of its trails. 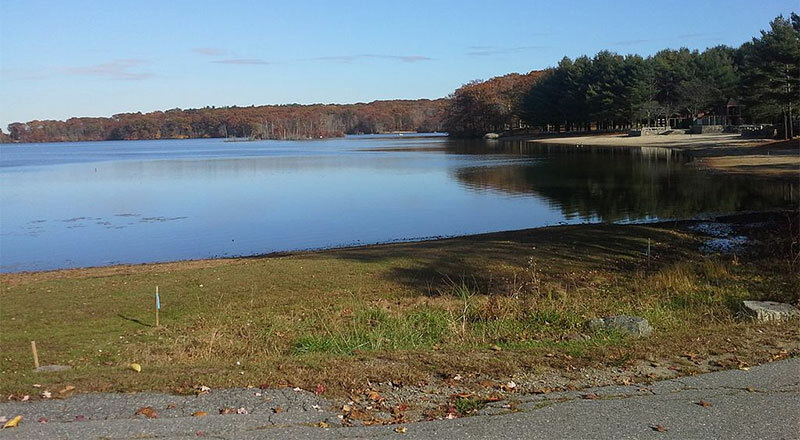 Some of this acreage is occupied by the centerpiece of the park—Olney Pond, a deep water lake that adds considerably to the attractiveness of this location. Many of the trails at Lincoln Woods State Park are old wood logging roads, leading off of which are countless miles of exciting single track. Each of these courses offer riders a number of great challenges in the form of obstacles, including jutting roots, rock gardens, river crossings, bridges, jumps and a number of switchbacks as the roads begin their uphill climb. The many trails at Lincoln Woods State Park have a long and storied history, dating back to the 1800s, when most of the land served as farm acreage and its trees were used in the state’s booming forestry industry. Today, the local mountain biking chapter, Rhode Island NEMBA, holds a popular “food bank” ride at Lincoln Woods State Park in the week preceding Thanksgiving, with all proceeds going to local food-based charities. Situated in the city of Cumberland, Rhode Island, Diamond Hill State Park is home to the trail known as the “Rhody-Flow,” an exciting, downhill-only course that is generally suited for riders of all ages and ability levels. Diamond Hill State Park has an average downhill grade of 9 percent and a maximum grade of 13 percent—or 8 degrees. Here riders will find a total of four downhill courses—routes that all commence from the same trailhead. The courses vary greatly in terms of their level of difficulty, and all feature a variety of berms, drops, jumps, bridges, gaps and other obstacles that make the course so attractive to the area’s more experienced riders. Diamond Hill State Park also offers a popular pump track, where riders can practice their downhill riding and bike handling skills without the danger that can often be associated with the more challenging physical tracks. The well-ridden Diamond Hill Trail, the most popular route in the park, is a 5.6 mile, moderately-trafficked course that features some superb scenery, including rolling terrain, wildflowers and plenty of sparkling water. Diamond Hill State Park offers a number of activities and “Fun Rides” throughout the year, and its trails are generally accessible from the months of March through November, excluding instances of unseasonable or inclement weather. Prudence Island is a great place for individuals and families to enjoy a lazy ride amid some of the best scenery in Rhode Island. Prudence is the largest island in the state, situated in the middle of the breathtaking Narragansett Bay. Prudence is about 1.5 miles wide at its widest and about 7 miles long, with about two-thirds of the island under permanent conservation or state control. Although there is no bridge from the mainland to Prudence Island, visiting riders can always take advantage of the ferry service, which leaves daily from the town of Bristol, CT. The mountain biking trails on Prudence Island are, for the most part, wide, flat and smooth, making them absolutely perfect for beginner riders and sightseers. There are virtually no climbs to speak of, and only a few drops that could be considered steep. There are, however, a few well-placed obstacles to challenge riders, including bridges, berms and even a few rocks. Taken together, these obstacles make for a very entertaining ride and a great way to spend a spring or summer day. Prudence Island is a quiet and peaceful paradise, with a number of parks and green spaces, trendy shops, tasty restaurants, museums, art galleries and cafes; and many of the island’s “city trails” take riders very close to these wonderful amenities. When getting to Prudence Island, remember that the ferry dock is located on Thames Street between John & Church Streets in Bristol. Parking in this bustling transportation center requires a bit of time and patience, but the reward is much greater than any inconvenience you may encounter. Note: While Prudence Island is indeed a wonderful locale for a relaxing mountain biking ride, locals warn visitors to always be aware of the island’s deer ticks, a potential source of Lyme disease. These ticks are usually found in the grasses along the banks of the island’s trails, so as long as you don’t venture off the marked routes you should have nothing to worry about.